Tour Around Koh Taen (Cora Island) is very interesting trip to explore Koh Taen (Coral Island) in nearly full day trip. The trip will combine with snorkeling, kayaking, cycling, trekking in Koh Taen. Trip will start from picking you up from the hotel in Koh Samui. Take you to Tong Krud Beach pier to take the long tail boat. The long tail boat take about 20 – 30 minutes at the snorkeling spot nearby Koh Taen (coral Island) for snorkeling. Then go to relax on the white sandy beach of Koh Madsum. After that heading for lunch at Koh Taen Marinabay Resort & Restaurant. In the afternoon is the sightseeing program. Tour Around Koh Taen with the golf cart or by the bicycle to explore the places in Koh Taen. You can see the beautiful white Big Buddha and see the panorama view of Koh Taen. Walking along the walk way to see the mangrove forest. 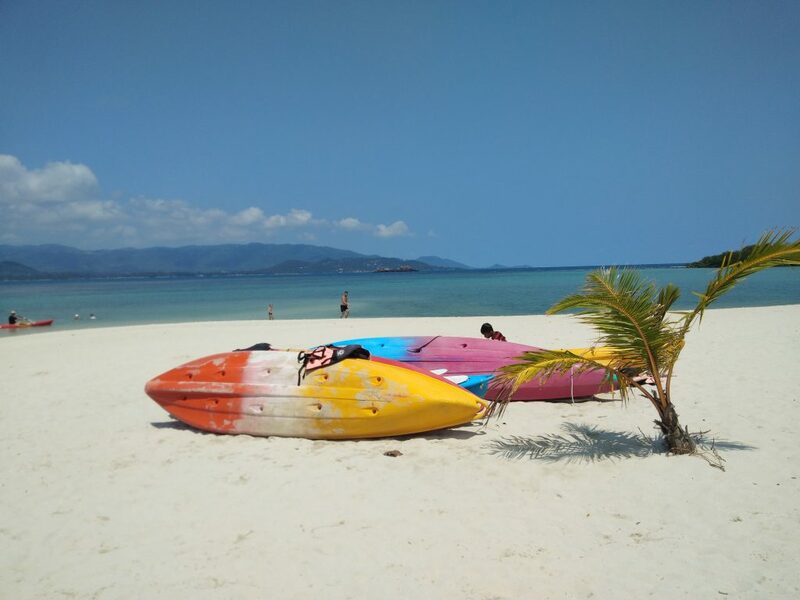 Doing kayaking (or fishing, you can choose) Then come back to Koh Samui. And the car will send you back to the hotel. Tour Around Koh Taen (Coral Island) Snorkeling Kayaking is the only one trip that take you to explore the places in Koh Taen. Because another tour program just snorkeling nearby Koh Taen but not get in Koh Taen for sightseeing. So, this is the best option to visit the attraction places inside Koh Taen in one day. If you have all just adult(s) and wish to pay by credit card, you can pay immediately in the payment form. But if you have the children in the group too, just book in inquiry form or click Book Now button above to fill your detail, and we will send you a confirmation by e-mail and you can pay at the pier in cash on the day, but if you prefer to pay by credit card, just inform us in the form too, then we will send you the PayPal link for you to pay by credit card. 10:00 Arrive at snorkeling spot of Koh Taen where you can see a lot of fish and corals. 11:00 Going to Koh Madsum to relax on the cape with the whit sandy beach there. 11:45 Heading to Koh Taen Marinabay Resort & Restaurant for having lunch. Along the way you will enjoy with the scenery along the coast line of Koh Taen. 12:30 Arrive at Koh Taen Marinabay Resort & Restaurant, then have Thai set menu lunch. 15:30 Departure from Koh Taen for heading back to Koh Samui. By law now, it is not allowed to feed the fish when you do snorkeling.